I am a pretty big fan of the two largest sci-fi franchises in history: Star Trek and Star Wars. Though there is a bit of a war between the two among some factions, and there's the general idea that you can't be a fan of both, I say "Nonsense!" When I was around 12, I had an idea for a crossover story that would bring the two together under a single universe and story arc. So, my interest in coming up with such a story goes back a long way. When Star Trek was rebooted, I started thinking about the subject again and in 2012 I came up with what I think is a plausible overall outline. And since Star Wars: The Force Awakens has been a smashing success, pulling in nearly $800 million in just 10 days, and with Star Trek Beyond coming out in July 2016 (for the 50th anniversary of the franchise), I thought now would be a good time to share my little idea with everyone. This isn't an alternate universe or some weird time travel tale of Kirk defeating Vader. Both "universes" actually happen in OUR, real universe. In short, Star Trek is the distant past to Star Wars. I've tried to do my research and take into consideration the main canonical events of both worlds as well as official expanded stories. To help my story make sense, I've added two "official" timelines, one for the associated events in Star Trek and another for Star Wars. But while I've paid attention to the "history" of the two, my tale takes place far after any Enterprise and long before the Millennium Falcon. The Federation leaves the Milky Way galaxy after a new war between the Borg and Species 8472 destroys much of the galaxy. After using stolen Borg technology to open up a hyperspace (transwarp) corridor, the remnants of humanity, along with other species, find their way to a new galaxy…far, far away. Over many years, the humans and Vulcans intermingle and accelerate their “spiritual” evolution, incorporating ancient ideas used by the inhabitants of the new galaxy. In time, the remnants of the Milky Way convoy splits into two factions as they spread throughout the new galaxy (what will become the Sith and Jedi). One faction turns into a trade federation (fulfilling the previous economic role of the United Federation of Planets) and the other helps to spawn the Republic. At some distant point in the future, while humans remain physically similar, their enhanced evolution allows them to tap into the Force and use it very well. This then begins the history of the Republic, the Jedi/Sith conflict and in time the canonical story found in the Star Wars films and Expanded Universe. c. 1 million years ago – Sargon’s people explore the galaxy and colonize various planets, possibly including Vulcan. c. 8,000 BC – The Dominion founded in the Gamma Quadrant by the Changlings in a different form. c. 4th century AD – The Vulcan “Time of Awakening” begins, led by Surak. c. 4th century AD – The Dominion are founded in their current form. c. 9th century AD – Kahless unites the Klingon people. 1871 – The Cardassian Union is established. 2032 – Zefram Cochrane is born. 2063 – First warp test (First Contact film). 2103 – Earth colonizes Mars. 2111 – Jonathan Archer is born. 2161 – United Federation of Planets forms (Earth, Tellar, Andoria and Vulcan). 2230 – Spock is born. 2233 – Kirk is born. 2305 – Jean-Luc Picard is born. 2364-70 – Next Generation series. 2472 – According to "Q," humans would be in the Delta Quadrant by this time. 26th century – The Federation now includes the Klingons, Ithenites and Xindi. 27th century – The Tox Uthat is created. It’s a device that can halt all nuclear fusion in a star. 31st century – Time travel is commonplace. 123rd century – Radiation levels in the Andromeda galaxy become intolerably high. 13 billion BBY (Before the Battle of Yavin) – The Galaxy is formed. c. unknown – The Celestials or “Architects” were an ancient civilization who were present long before the Infinite Empire and may have had a role in guiding the balance of the Light/Dark sides of the Force. 5 billion BBY – Life first emerges on Goroth Prime. 2, 006,200 BBY – The Columi first evolve. 2 billion BBY – The Columi achieve interstellar travel for the first time. The Wookiees and Sullustans evolve. 1 billion BBY – The Corellian system is formed by the Celestials. 100,000 BBY – Coruscant is now entirely covered by its principle city, later known as Galactic City. - The Celestials had contact with or co-existed with the Gree, Kwa, Sharu, Columi, Killiks, Humans, and Taung. - The Sith race begins to develop their culture on Korriban. 57,000 BBY – Utapau is colonized. 36,435 BBY – Philosophers & scientists from several systems gather on Tython to mystical knowledge. The Force is discovered. The Je’daii Order is founded. 35,000 BBY – The Infinite Empire of the Rakata is formed. They use the Dark Side. 30,000 BBY – The Infinite Empire reaches its peak and constructs the Star Forge. 27,500 BBY – Human colonists land on Alderaan. 25,793 BBY – Tythan scholars begin to use their knowledge of the Force to pursue power, a conflict arises which devastates Tython. 25,783 BBY – The Jedi Order forms from the ashes of Tython’s Force Wars. 25,200 – Due to a major plague the Infinite Empire collapses. 25,053 – The Rakatan Hyperdrive is adapted and widely distributed by the Corellians. – The Galactic Republic is founded and Coruscant becomes its capital. 25,000 – Jedi Knights found a school on Ossus, modern hyperdrive is developed. 24,953 – The Jedi Order swears loyalty to the Republic. 24,500 – The first war between the Jedi occurs when some are drawn to the Dark Side. 20,000 – The Inner Rim is settled. 7,003 – The Second Great Darkness (Hundred-Year Darkness) begins when Dark Jedi’s create monstrous armies to battle the Jedi Order. 6,900 – The Dark Jedi’s lose the war, are exiled and found the Sith Empire which remains unknown to the rest of the galaxy for almost 2,000 years. 5,000 – The Great Hyperspace War begins when Gav & Jori Daragon accidentally lead the Sith to the Republic. The War ends with a Republic victory. - Tatooine is discovered by the Republic. 4,995 – The Klatooinian Trade Guild is founded on Klatooine. 4,050 – Lorell Raiders are defeated by the Jedi resulting in their hatred within the Hapes Consortium. 4,019 – Four Jedi Masters establish the Jedi Temple over the Force Nexus on Coruscant. 4,015 – Old Sith Wars begin. 4,000 – Great Sith War begins. 3,959 – Jedi Civil War begins. Ends in 3,956. 3,956 – Sith Civil War begins. 3,955 – First Jedi Purge. 3,681 – Great Galactic War begins. 3,653 – Great Galactic War ends with the sacking of Coruscant, Cold War beings. 3,641 – Cold War ends and the Second Great Galactic War begins. 2,000 – New Sith Empire formed, New Sith Wars begin. 896 – Yoda is born on an unknown planet. 867 – Naboo joins the Republic. 850 – A 10,000 year old lightsaber is discovered on Ossus. 232 – The Jedi notice that the Force is in “flux” and fear the Dark Side is growing again. 124 – The Galactic Senate declares the Outer Rim to be a free trade zone. 121 – The armed conflict between the Human settlers and the Gungan natives of Naboo comes to an end. 112 – C-3PO is created on Affa. 92 – Qui-Gon Jin is born. 82 – Darth Sidious is born on Naboo. 65 – The Hutts take control of Tatooine. 60 – The Millennium Falcon is contructed over Corellia. 57 – Obi-Wan Kenobi is born. 46 – Padme Amidala is born. 41 – Anakin Skywalker is born on an unknown world. 32 BBY-0ABY – The Star Wars film series. --- Origins of humans: the Star Wars "Celestials" are the same group of aliens we learn about in Star Trek Next Gen: The Chase episode, who “seeded the primordial oceans of many worlds”. Humans are thought to have originated on Coruscant, but this is only because they've been there for so long (at the time of the Star Wars films) and were there long before the emergence of the Jedi. Plus, they were indeed created by the Celestials. 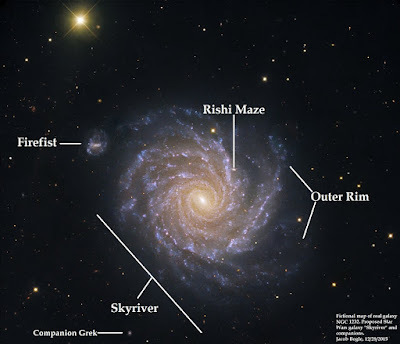 --- Access to Star Wars Galaxy: The Star Wars “Galaxy” (called "Skyriver") has a hyperspace disturbance which prevents travel into or out of the Galaxy. However, in 132 ABY (After the Battle of Yavin) the Yuuzang Vong found “Vector Prime” in the Outer Rim which acted as a path through this disturbance. The "Federation Remnant" stumbles across this region (c. post 31st century real time – pre-100,000 BBY). --- Time line: the Battle of Yavin can be the same as "Year Zero" for story purposes, with humans coming to Skyriver in 150,000 BBY, or approx. 150,000 years after they left the Milk Way which will be set in the year 3,324 AD. Thus 150,000 BBY is 153,324 AD. It will take humans approx. 20,000-25,000 years to reach Skyriver. Map of NGC 1232, annotated with fictional Star Wars titles. Click for larger view. --- Location: The Milky Way is 100,000 light years across; it is in the Local Group within the Virgo Supercluster. I propose that Skyriver is actually a known galaxy, NGC 1232, located 60 million light years away in the Eridanus cluster. It has a satellite galaxy, NGC 1232A, which could be "Companion Besh" aka "Firefist" in Star Wars. At Warp 9.6 it would take 20,345 years to reach to reach NGC 1232. The Milky Way and the Star Wars “Galaxy” are really two galaxies in the same physical universe. The “Galaxy” will be referred to as “Skyriver” which is the name of the galaxy given by the Nagai people of the satellite galaxy Firefist. changeable state, and from whose home world (during DS9) they would coalesce out of a great ocean of Changlings into single individuals. In the distant past, some 5.5 billion years BC, a race of ancient beings, known as Celestials/Changlings, originated from an unknown galaxy and embarked on an immense journey across the known universe. They were the first multi-celled, intelligent, beings to evolve as a manifestation of midi-chlorians and the will of the Force which pervades the universe. They discovered the ability to travel faster than light long before any others, and set about seeding countless galaxies with a unique mixture of matter and energy, called the Primordial Primer, which could adapt to the wide-ranging environments of planets and in time, evolve into divergent life-forms. One group, carried by their “Living starships”, came to Skyriver in 5,300,000 BBY. Another made their way to the Milky Way c. 4,000,000 BBY. I propose that Midi-chlorians are actually dark matter life forms that helped to build the framework of the universe and bind it together. They helped turn Skyriver into a place that serves as the ultimate will of the Force and as such they can only be visually detected in Skyriver, thus unknown to the rest of the universe's civilizations. The Celestials returned to a series of primary galaxies, Skyriver being one of them, leaving the Milky Way and most others to undergo more natural “hands-off” development. By the year 3,025 (647 years after the events of Star Trek Voyager), the Federation includes nearly all eligible planets in the Alpha and Beta Quadrants with extended outposts in the Gamma Quadrant, and multiple probes and small trading/scientific posts in the Delta Quadrant. A Second Temporal War between the Federation against the Borg Remnant and their anti-Federation allies, along with various other cybernetic life forms, has left the galaxy full of temporal fractures. These fractures make time-travel very dangerous and offer too many variables for accurate predictions of the outcome of actions taken. Thus, an unprecedented treaty was signed between the Federation and the new "Borg Alliance", putting an end to the war and to time travel. During the War, the Borg Alliance rebuilt a large portion of their Delta Quadrant transwarp conduit network that was destroyed by Voyager nearly 700 years prior. The Borg had shifted their primary objective from constant and total assimilation, to a mix of assimilation and cooperation with like-minded species (perhaps the Na'kuhl from "ENT:Storm Front"). During this change and build-up, the Borg Alliance once more tried to open a gateway into fluidic space, the domain of Species 8472. Their purpose was not to engage 8472, but to harvest the rich organic materials found in fluidic space. This material was difficult to assimilate and so it was thought that if it could be brought into the new Borg Collective, that the Collective in turn would become more difficult to be destroyed by the Federation, and, in time, should they engage 8472 again, would be better able to defeat them. Their plans were interrupted by the results of the Second Temporal War, which lasted 147 linear years. Although the war ended in a treaty, the Borg were once again left in a highly vulnerable state. So in a desperate bid to protect themselves, they opened up a quantum singularity into a region of fluidic space they thought would be uninhabited and began to harvest the organic compounds. The Borg remained undetected for four years and was somewhat successful at adapting the compounds to their own desires. However, they were discovered. The ensuing war between the Borg Alliance and Species 8472 brought total chaos to the galaxy, eventually engulfing the Earth itself, and putting an end to most life after 125 years of war. The remnants of the Federation included Humans, Vulcans, Betazoids and others. In 3,328 AD, they combined their resources and set off to find a new home. This would lead them to Skyriver after drifting through space for more than 20,000 years; a wondering extra-galactic civilization had finally found peace. A vast armada of ships from dozens of worlds departed the Milky Way galaxy for parts unknown. Each species’ remaining population is fewer than 10 million. Through the over 20,000 year journey, some decide to leave the armada and find homes in one of the many dwarf galaxies surrounding the Milky Way, while other refuse, owing to their proximity to the ravaged Milky Way. Others still end up staying behind as the armada passes Andromeda. The core ships (Humans, Vulcans and others) remember the story of the Kelvans from Andromeda who stated the galaxy would become uninhabitable within 10,000 years, so, they carried on, encountering other nomads, fighting off extra-galactic scavengers, searching for materials, fuel, etc., and generally maintaining an average speed of Warp 7 (although going faster at times and stopping for periods of rest etc). After 25,000 years they enter the far outer reaches of Skyriver in the year 28,328 AD (or 178,328 BBY). Once they make it to Skyriver, their resources are drastically low and they decide to enter the galaxy. Having met nomadic peoples, they have heard that entrance into Skyriver via warp/hyperdrive is impossible and they know that approaching the galaxy at sub-light speeds would take thousands of additional years. They send out multiple probes to survey as much of the galaxy as they can, trying to find a weakness in the barrier. After a period of searching they find what will be known as “Vector Prime” (Yuuzang Vong) and name it “the Sky River,” after its properties. This “river” is an opening in the barrier that acts like a vortex, pulling in energy, matter and other substances from the wider universe and enriching the galaxy. The river’s gateway also moves, tracing the diameter of the galaxy once every million years. This is why it is so difficult to find and why so few, if any, inside the galaxy knew about it. It was originally devised by the Celestials as a way to help refresh the galaxy and keep it connected to the outer universe via the Force, while protecting the "Prime Force Nexus". Knowledge of this gateway would soon be forgotten, but its name would remain as the informal name of the galaxy. The armada is then swept in and passes through the companion dwarf galaxy Firefist, where the name "Sky River" would be exchanged and the people of Firefist would one day be given credit for the name’s invention. Once inside the galaxy, the “river” slows and incorporates itself into a network of force nexūs. The people, unaware of the Force, would simply follow what they saw as an energy river to their final destination deep in the Core, to Coruscant. Slowly following the river they would encounter many species. They would eventually intermarry and introduce force-sensitive genetics into this new Human race that developed over thousands of years of travel (90% human, 5% other Federation races, and 5% Skyriver native). The other Federation species likewise underwent a similar change as humanity. They have now forged a new beginning and will make possible the story of Star Wars. By 100,000 BBY, they have colonized Coruscant and begin to spread throughout the galaxy. Begin driven by different factors and old "Milky Way" instincts that have become a sort of genetic memory among all the survivors, some groups of people split off and are drawn toward either the Light or Dark side of the Force over the millennia. These instincts also help in the development of the Republic and Trade Federation. Copyright info: This is a work of fan fiction for non-commercial purposes. The original idea for Star Trek came from Gene Roddenberry, and Star Wars from George Lucas.The names of organizations (like the United Federation of Planets or the Galactic Empire), names of species (like Vulcans and Wookiees), names of planets (like Andoria and Utapau), and the events that happened within the movies, TV series, and published printed materials all belong to their respective copyright owners: Paramount, Disney, etc. The only thing that I've created was the story that connects the two "universes" and whatever personal interpretation of events/possible connections that I've made to make the crossover work. However, it is still heavily derivative of the original source works and, to my knowledge, aren't eligible for copyright. In short, I don't own Star Trek or Star Wars and this is just a random story created by a random fan!